Here it is: After living in Europe with her husband, Kurt (Paul Lukas), and children, for many years, Sara (Bette Davis) returns home – this is after WWII has broken out, but before the US has gotten involved. And home, in this instance, is suburban Washington D.C., where her widowed mother (Lucile Watson) maintains the family estate. But mother is no ordinary widow – no, her dead husband was a long-time Justice of the US Supreme Court and rich as hell. Upon her return, Sara finds her mother entertaining various houseguests, primarily an amoral and opportunistic Hungarian baron (George Coulouris). When the baron determines Kurt was working as an anti-fascist in Europe, carrying money for the underground, he realizes he can leverage that information for his own benefit. Except, Kurt isn’t about to be leveraged and so kills the baron, to return to Europe himself and continue his work. Herman Shumlin was a longtime Broadway director, with a career spanning 50 years. His Hollywood career was decidedly shorter, spanning three years and just two films – Watch on the Rhine, and Confidential Agent (1945). I have no idea why his Hollywood career was so abbreviated, but if I had to guess, it’s because based on the direction of Watch on the Rhine, he didn’t really have the chops to be a film director – no shock, but being a theater director works an entirely different set of muscles than a film director. Which meant that rather than shoot Watch on The Rhine cinematically, Shumlin directed it much as he would a stage play. Which means instead of giving the camera, and the frame, some life, he tends to keep the camera static, filming large rooms in wide-shots, with the actors seemingly rooted in a single place as they spoke. While this might have made the material come alive onstage, where the crowd was in the room with the performers and could borrow some of their energy, onscreen it just lays there. I wish I could say something better about Paul Lukas, who plays Kurt, and I should be able to, given he won the Oscar for Best Actor. After all, even an Oscar-winner I didn’t like usually has something to recommend it. But if there is here, I don’t see it. First, Lukas isn’t hardly the lead of the film – he’s barely in the movie for the first half hour. Then, for the next fifty minutes or so, he’s basically a non-entity. He doesn’t disappear as such, he’s just a vaguely handsome man shuffling around from scene to scene without doing much. Sure, when he does speak he’s usually charming, but that’s about it. Which left me to wonder how this performance managed to be the consensus performance of the year – after all, it not only the Oscar, but the Golden Globe and the New York Film Critics’ Awards. It’s really only at the end when you finally see what it was that probably won Lukas the Oscar –there in the last 20 minutes. That’s when he finally shows some passion, kills the baron, then speechifies about killing being an awful thing and how he looks forward to a world without it. Which means it’s only in those last 20 minutes when he stops being a wax figure in a museum and starts trying. So there’s a lesson to all you noobs – so long as you backload your performance with the good stuff, the people in the theater will forget just how meh you were for the rest of the film. Here is the ultimate truth about Watch on the Rhine – at 106 minutes it’s easily too long by 30 minutes. After all, the first half hour of the film is literally spent on extended character work, introducing us repeatedly to the various characters, and letting them interact. This is not to say the various character pieces are bad, or that the character work in a movie should be avoided – after all, it is the characters that make most films interesting. But there is a danger in overdoing the character work. If it’s repetitive, or not very interesting, or just drifts into the ether with no bearing on the later plot, it makes it all feel like a bunch of wheel-spinning. Even so, even with all the wheel-spinning, the movie goes down easy enough. It just could have gone down easier. Am I The Only One Doing It Right? Watch on the Rhine had two acting nominees at the 1943 Oscars – eventual Best Actor, Paul Lukas, and Best Supporting Actress loser, Lucille Watson. 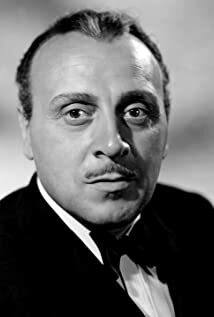 Despite this, the best of the performances in the film is actually given by George Coulouris, as the ill-fated Baron de Brancovis. Because of all the actors in the film, he’s the only one who seems to understand the type of movie he’s in and how to play it. He alone seems to understand the material and what it needs. Where the others shade toward didactic and earnest and pure – i.e. cinematically heroic – Coulouris is the one who gets that this story is about rot and corruption, and he plays it with a certain amount of oil. This is not to say he chews the scenery and makes a ridiculous spectacle, because he’s actually fairly reserved. That said, he does have the proper sneer, and cocked eyebrow, for the material. And when it’s his time to snivel, he does it to perfection. Perhaps the larger lesson to take from his performance is that it’s far easier to play the villain than the saint. The saint always has to be strong and righteous, even when killing. He must always be one-dimensional and free of angst. If he is not, he is not a proper movie hero. It’s why Jesus and Gandhi are not allowed to have faults on screen, and is why they tend to be boring. But the villain, because he’s the villain, gets to have moral complexity. Gets to have depth and humanity. While the hero can only be heroic, the villain can be anything – he can even be a person. Which means it’s far-easier to play the villain than the hero. So, while it might be unfair, Coulouris comes across better in the film than Lukas, simply because Lukas doesn’t quite have the goods to be the human embodiment of unending virtue. For a movie that is explicitly anti-fascist – after all, an anti-fascist kills a man and escapes to continue his anti-fascist work, and the movie refuses to punish him – Watch on the Rhine has some very unreconstructed views on race. No, they aren’t explicit, but they aren’t too subtle about it either. Specifically, the mother of the main character, played by Lucille Watson, is a wealthy widower with a number of black servants. But these aren’t black servants in the way Anthony Hopkins was a servant in The Remains of the Day, with dignity and cool remove. No, these are servants in the mold of Pork from Gone With The Wind, out there in the yard chasing around the chicken and talking about being house servants. There is not one black character who is allowed any sense of humanity – they are all caricature. Which makes the message of this movie muddled. On the one hand, it denounces the tenets of the Nazis, and the fascists, while on the other hand it plays out some pretty distasteful racial stereotyping. At best, it’s problematic. At worst, it’s downright offensive. Best Picture 1943 was Casablanca, one of the greatest films of all time – not just a best in it’s year, but one of the best of all years. Even were Watch on the Rhine a better movie than it is, it still wouldn’t be good enough to overtake Casablanca. But Watch on the Rhine is not a better movie. It’s a lesser movie. And was rightfully overlooked for the Oscar. Apparently I’m having a brain fart lately, which means I doubled-up and did a second entry in this project for 1943, after previously writing on 1943 Also-Ran For Whom The Bell Tolls. What does this mean for you? Just more free content. Or, as I like to call it, Double prizes! 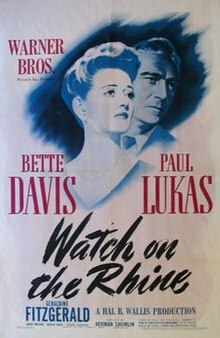 Shumlin was the director of the original stage version of Watch on the Rhine, also starring Paul Lukas. I’ve made the argument before, and I’ll make it again, that despite the portrayal of some of the black characters in the film, Gone With The Wind was relatively progressive for it’s time, given it made Mammy the only truly virtuous, and respected, character in the whole damn film. That said, it would never pass muster today, and shouldn’t.